The Marine Debris Bakelite Project turns plastic collected from Australian beaches into a new material. The team are offering individuals and small businesses the opportunity to invest in the project by purchasing products that have been created using Marine Debris Bakelite (MDB). These functional, collectable objects made by some of the world’s best designers help clean up the oceans as they’re created from 100% recycled plastic. MDB has a marbled quality that looks and feels like early Bakelite. It is made using small scale industrial and hand manufacturing processes developed entirely by the team. Those who pledge their support to the Marine Debris Bakelite Project can purchase products from the first MDB collection. 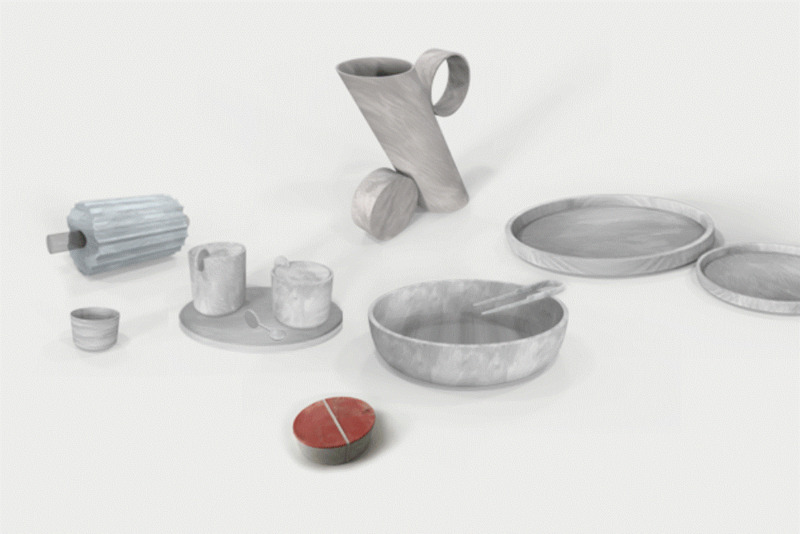 The collection comprises 11 pieces designed for tabletop use. The team notes that the chosen international designers each bring interesting and relevant design skill to the table, which they hope will raise the bar of sustainable design and the profile of the issue. The pieces in the collection are Table Light by Greece is For Lovers, Cup by Kirstie Van Noort, Sugar Bowl, Creamer, Tray Trio by Ladies & Gentlemen Studio, Jug by Jonathan Zawada, Serving Bowl by Jasper Morrison, Chef’s Tweezers by Martì Guixè, Plates by Formafantasma, and Bento Box by supercyclers. This project takes a very direct approach, as each product bought and used is plastic that their ocean collection partner will remove from a beach. Pledges will enable them to go into production and make the tableware in the MDB collection, which are made-to-order so there is no waste. The pledges will pay for the ocean shoreline collection, design, pre-production, CAD modeling, 3D print prototyping, mould-making and making the products. The entire production will take place at the Vert Design HQ in Sydney.